Too late for Easter but just in time for Spring/Summer: colourful raffia hats. I actually made these last Spring/Summer–some during a trip to Hawaii–but it took me forever to block them! 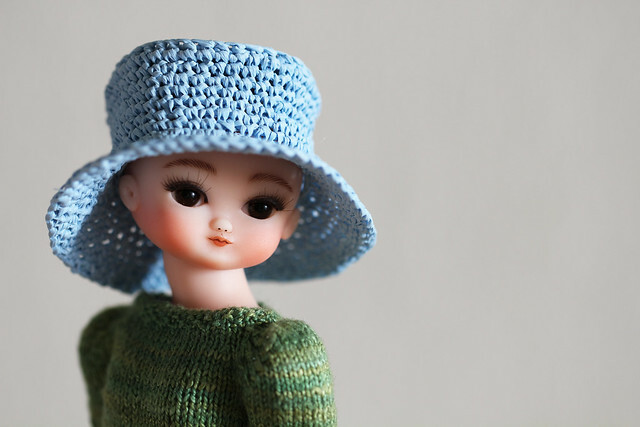 It has been so long since then but I think I made them with the intent of fitting Poppy Parker and her kith and kin. However, knitting on the road without a fit model can lead to interesting results. The hats fit Poppy but they are quite loose. The upside is that, with a hat pin, this allows for optimal styling. They fit Daisy very well without her wig. In fact, I think that they suit her best. Keep in mind that she is absolutely adorable and everything looks best on her. Heheh. They also fit very well a certain other Mademoiselle (you know, the one who "is not a doll"). Email me for pictures of that if you are curious.